Sometimes I feel as if I find inspiration in the oddest of places. I found a copy of the 1979 Reader’s Digest Complete Guide to Needlework in a thrift store two weeks ago. It’s also the best $1.99+tax I’ve ever spent. It’s gorgeous, hard cover, full colour photographs. Many of the knitting and crochet designs are incredibly dated (and no, those designs have not made a comeback yet). It has a huge section of embroidery, some information on quilting and rug-making (latch hook and punch needle). There’s information on making lace (there’s more than just tatting [! ], which I never knew before). There’s some great stitch patterns that I have never seen before in any of the other stitch dictionaries that I own, so I was really excited to be able to find this. Surrounding my new-old book is some new yarn. 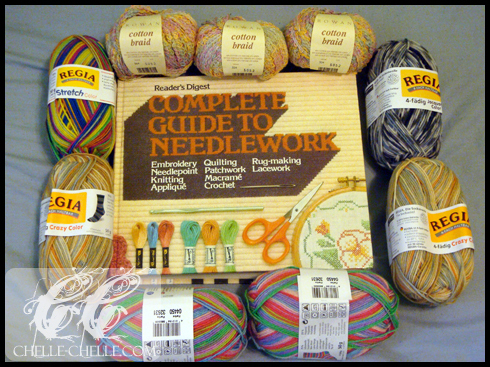 All of the Regia is sock yarn, the four closest to the bottom are going to be knitted into socks. The other two are marked for dolly-related knitting. But the three at the top? Oh, I only wish you could all see how beautiful it is. It’s Rowan’s Cotton Braid and I just got it today. It’s a discontinued (boo!) line of yarn from Rowan and it’s in this gorgeous rainbow of colours (goes from pinks to oranges to greens to blues to violets). It is a novelty-type yarn (which kinda surprises me that I even bought it because I generally don’t really like working with novelty yarns), but it’s gorgeous and made primarily of natural materials (68% cotton, 22% rayon, 10% linen). I can definitely see a nice summery scarf made from it! Knitting in the round (with both circular knitting needles and double pointed needles [DPNs]) is something that I’ve recently (sort of) mastered. I lamented about my inability to ‘get’ the whole circular knitting thing and a Twitter/Flickr friend (irulethegalaxy) helped me out by explaining the basics to me (and was a lot more patient than my sister ever was when explaining it to me!). My first attempt at knitting in the round was done with double pointed needles. I found it difficult at the beginning because after spreading out my stitches onto three needles, I was left with 6 different pointed ends constantly poking into my fingers or the palms of my hands. But eventually, I did “get” it and ended up with a short, stubby little tube. My tension was off, there were little visible ‘ladders’ so I could see exactly where the stitches changed from each needle, but it was okay, because I could knit with DPNs! For my second attempt at knitting the round, I grabbed a pair of circular knitting needles (8mm) for this lovely ball of super bulky weight yarn. The one thing I love about chunky knits is that it works up relatively quickly because everything’s a lot bigger in width, height and overall thickness. 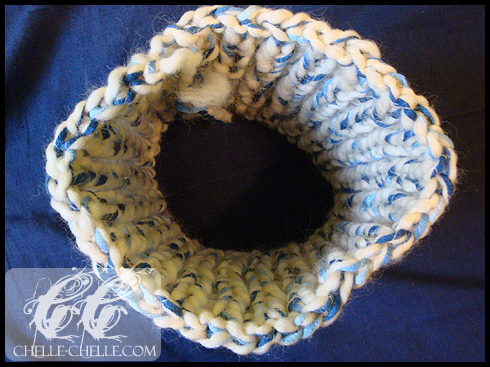 It’s a lot different with crocheting in joined rounds (joined rounds, unless you’ve got the world’s best tension, results in having a noticeable ‘seam’ where you joined the rounds) but it’s quite similar to crochet in the round (no seam, spirals up), which I’m most familiar with. I’m a lot more comfortable with freestyling my own designs in crochet, so unless there’s no shaping involved, chances are that I’ll be reaching for a crochet hook instead of knitting needles for making amigurumis, but I do love the fact that I know how to knit in the round for both DPNs and circulars! Been working on it for year plus, all the knitting is done! Made in 100% acrylic (Red Heart Super Saver and Bernat Satin) and I just need to tuck in all the ends, since I’m incredibly lazy and dislike tucking in ends on things. Intended recipient: myself (again). Worked on it on and off since August, still on-going though. I still have 10 more balls of yarn left for this (using the very much retired Moda Dea Dream yarn in Leaf Green), so I still have approximately 10 more numbers to add to my Stolen Pi Stole (original pattern). Intended recipient: myself. Not started (yet! ), but I do have all the colours I need for it. Intended recipient: unmentioned. Not started yet, light cream in colour (delicious! ), 6 balls in total to work into the scarf. Intended recipient: unknown (but not myself, too many scarves for my neck). Not started yet, still need to find the colour of sock yarn that I’d like for the project (likely to be self-striping yarn). Intended recipients: the dolls. Not started yet, planning to be a dark pink. Unsure of when I’ll get a chance to make this one. Intended recipient: unknown. 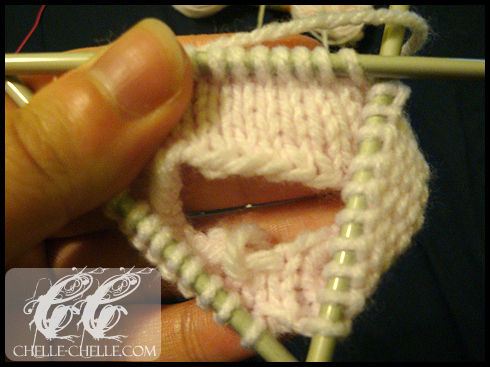 Not started yet, still need to buy the yarn for it, but it should be a fairly quick project, looking at the pattern. Intended recipient: unmentioned. I have come to the conclusion that I own a lot of scarves. I have… 2 that were made for me by my sister (the Slytherin scarf and a pink and black one that has a matching hat), 2 that I’ve had since I was little (one’s baby/toddler sized, the other is small-child sized), 1 loopy boa that I received as a birthday gift from when I was in elementary school and 1 that I received as a gift in grade… 11, I believe. Now, that’s already 6 scarves. And they’re all different lengths, colours and styles. Plus the one that I’m working on right now is scarf #7. I already have two coat hangers full of scarves in my closet, I’m going to have to start hanger #3 after the Gryffindor scarf is completed. Plus… I have plans for more scarves. My really soft and fun-to-pet Red Heart Whirly? At least one skein is destined to become a mobius strip scarf (crocheted, not knit). I bought four. Realistically, it’ll take at most two skeins. And not even the full two skeins. I have 5 skeins of Moda Dea’s Dream in this light green… It was purchased with the intention of making this really nice filet crochet lace scarf/stole… But I guess if I can call it a stole, it doesn’t really count as a scarf, right? And then there’s all that Bernat Satin that my sister and I have somehow accumulated (I really have no clue how we end up with it all…). I’m going to be making (at least I plan on it) a rainbow scarf. We already have red, orange, yellow, green and white in Bernat Satin. I’d just need a blue and purple and then I’d be set… The white is for clouds at the ends. 3 more scarves (… 2 if I can count one as a stole and not a scarf!). Which brings my scarf count up to 10 (… or 9). Somehow grow a few more necks! That way I can wear more than one scarf at a time. Start finding a lot of friends who have really cold necks (… in spring?). Start making more scarves, learn more stitch patterns (for both crochet and knit) and gift them all for Christmas (… I do have nearly 9 months).